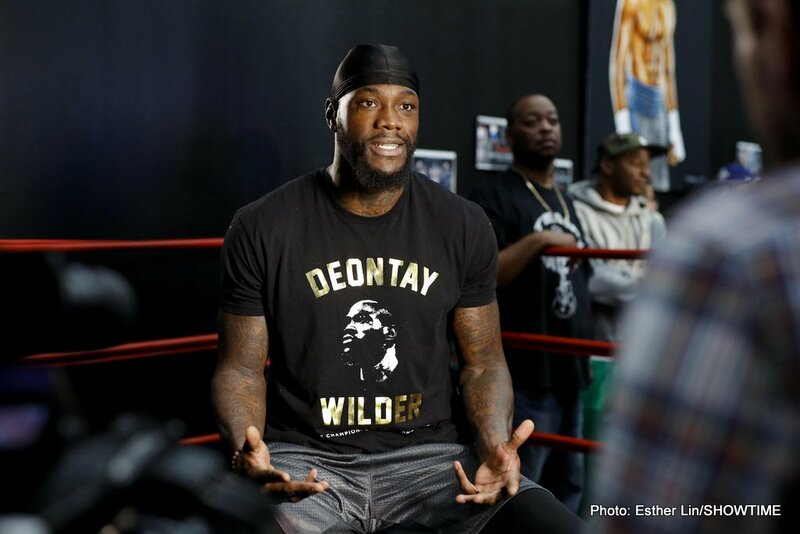 By Jim Dower: Luis ‘King Kong’ Ortiz found himself being asked a lot of questions about his positive drug tests during Tuesday’s media conference call with WBC heavyweight champion Deontay ‘Bronze Bomber’ Wilder (39-0, 38 KOs) to talk about their March 3rd fight on Showtime Championship Boxing. Ortiz (28-0, 24 KOs) was being peppered with a lot of questions about things he didn’t want to answer about his positive tests, and it turned into an ugly situation. When it stopped being questions about boxing and only about drugs, it put Ortiz in a tough situation. It’s obviously not the right way to help hype a fight by talking about positive drug tests. Ortiz has had a couple of positive drug tests in the last several years of his career. Wilder-Ortiz will be facing each other at the Barclays Center in Brooklyn, New York. The fight will be televised on Showtime on the 3rd of March starting at 9pm ET/6pm PT. Ortiz was in a tough situation being asked a lot of questions about the drug tests rather than the actual fight. Ortiz maintains that the positive test was due to him taking blood pressure medication that he failed to report. Unfortunately, the drugs can be used by some fighters to mask other drugs. Ortiz says he was using the drugs only to control his blood pressure. The World Boxing Council believes Ortiz’s excuse for the positive test and they’ve sanctioned the fight. That’s all that can be said. If the WBC didn’t believe Ortiz then the fight wouldn’t be sanctioned. The co-feature bout is former IBF junior middleweight champion Jermall Charlo fighting Hugo Centeno Jr. for the interim WBC 160lb belt. In another fight on the card, IBF interim super middleweight champion Andre Dirrell (26-2, 16 KOs) will be fighting a rematch against contender Jose Uzcategui (26-2, 22 KOs) in the first fight of the televised portion of the Wilder-Ortiz card on Showtime Boxing. This will be a defense for Dirrell, 34, of his interim IBF 168 lb. belt. Dirrell defeated the 27-year-old Uzcategui by an 8th round disqualification on May 20th. Dirrell was fouled after the 8th round ended when Uzcategui hit him after the bell had sounded ending the round. Dirrrell was knocked unconscious by the shot. Uzcategui had also hit Dirrell after the bell in round 4. Dirrell has received criticism from boxing fans who think he was faking that he was hurt. Since there’s no way of proving that Dirrell faked being hurt, you have to believe him and see it as a case of Uzcategui fouling him.